Very technical trail. Climbs and slick rocks are tough. You'll probably crash. 18 miles total if both loops are done, but you must do at least the first to get to the second. Don't ride alone. Very beautiful. Review: Not a Bike trail, unless you are wanting to be punished. It is not impossible as I rode some of it, but there is a lot of areas that need to be walked, both up and downhill. Very Technical, very rocky, very step and very dangerous. Checked in at the station with the Park staff. They were very informative and gave me plenty of warning. One guy took a spill and broke his collarbone, two ribs and a wrist while riding and had to be rescued by the park ranger and a fisherman (luckily he checked in the book and they went looking for him as he was not able to self extract). 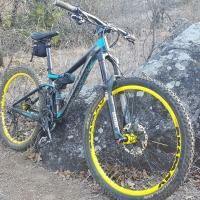 A great trail for hiking, but a very difficult trail for riding bikes and I am a technical rock mountain biking fool! Review: Very technical. Constant rock obstacles. Downed trees about every 50 yrds. No flow or speed. 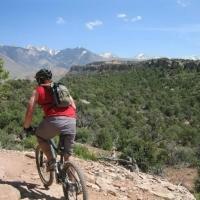 This not for anyone who likes or enjoys traditional mountain bike areas. Review: Excellent trail, very difficult. I prefer to ride the trail counter-clockwise by turning right after the swinging bridge. One can ride the south loop by turning left at the N/S loop junction and following the white blazes to Mary's Cove. From the campsite follow the trail south along the water to the bridge and backtrack to the park. Maps available at the park office, call or email naturehut@onenet.net The trail received marking and maintenance on January 21st 2012 but it still takes effort to follow; more so the north loop than the south loop. If u ride from the park and do the south loop it's about ten miles. Take water, food, and start early. If you're relatively strong your only difficulty will be following the trail in some areas. Call Paceline Cyclery at 918-456-0235 for more info! Review: Finally did the whole thing, had to bail last time. This is one tough trail. Official name is Greenleaf Lake Trail. From the campground to the swinging bridge, and the shoreline side of the South loop is Intermediate/ expert. The ridge line side of the South loop is a expert level blast. The North loop is a whole different animal. It is a primitive, minimal maintenance trail, do not attempt the North loop in the heat of the summer, and if you are not in very good shape, and comfortable with almost continuous technical riding. You will have many hike a bikes, a few crashes, and be bleeding when you get done. You've been warned, so go have fun. Overall a great technical trail. Also very scenic. Also got treated to a River Otter show. They were in Mary's Cove and didn't know I was there. Review: 18 mile loop. Worth it if you're up to the physical challenge. Turn left immediatly after the swinging bridge and stay on the leg closest to the lake. Beautiful scenery. Lots of deer. Take lots of water, some food and bug spray. Very few use this trail because it is physically challenging. Some poison ivy. The upper leg is mostly a foot path and unrideable. 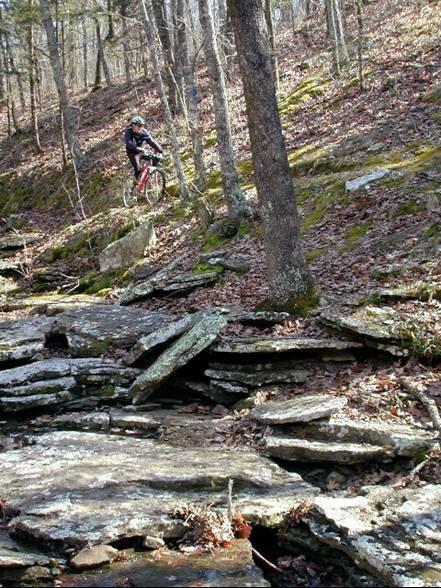 Review: Very technical, well-marked singletrack through Cherokee WMA. Rode from the Park to the South Loop and shortcut back to the swinging bridge on a WMA road because of 20+ horseflys and 104F heat. Not too (?) overgrown for Okla. in July though. First section to swinging bridge is very techical. There is some rolling single track on South Loop. Bring lots of water, food and time to ride. I will do all 18 miles someday in the fall, winter, or spring - probably an EPIC ride. Trail may be closed during hunting seasons or due to Camp Gruber military maneuvers. The State Park is great. You can even rent a mtn bike there. Oklahoma "ankle Express" Hiking Trail - Greenleaf State Park MTB Trail 3.00 out of 5 based on 7 ratings. 7 user reviews.